Iraq has admitted that ISIS jihadists captured huge caches of US-made weapons, including thousands of Humvees seized from Iraqi forces retreating from Mosul last year. The spoils of war have since then been used by ISIS to gain ground in Iraq and Syria. Islamic State (IS, formerly ISIS/ISIL) captured Iraq’s second city of Mosul in June 2014, as government forces retreated from the country’s Sunni stronghold. The number of potential heavy and light weapons abandoned by Iraq’s army remains unknown but over the past decade the US sold thousands of the armed vehicles to the Iraqis, in addition to tanks and other military hardware. Just this month the Pentagon estimated that at least half a dozen tanks were abandoned when Baghdad forces lost Ramadi, in addition to artillery pieces, and some 100 Humvees. Meanwhile the US approved new arms deliveries to the Iraqis last December to replenish the stock ransacked by IS. One contract allows the sale of 175 heavy M1A1 Abarams worth $12.4 billion, while another approves the delivery of 1,000 Humvees, equipped with M2.50 caliber machine guns and MK-19 40mm grenade launchers. They are exactly the types of weapons IS used to gain vast amount of territory both in Iraq and northern Syria. In fact, the first use of US-Humvees on Syrian territory was reported last year shortly after Mosul has fallen to jihadists. In mid-May IS gained control of the capital of Anbar province where Iraqi forces had held out against militants for more than a year. They also secured control of Palmyra in Syria, carrying out many executions. Meanwhile on Sunday CIA Director John Brennan acknowledged that IS gains in both Iraq and Syria did not really come as a surprise to the intelligence community. He attributed ISIS success to “a lot of factors” on the ground that came into play, in particular the lack of leadership in some Iraqi units and logistic support needed to fight extremists. The Humvees’ fall into the hands of IS has become a turning point in the group’s war against the government forces in Syria, Dan Glazebrook, a political writer and journalist, told RT. 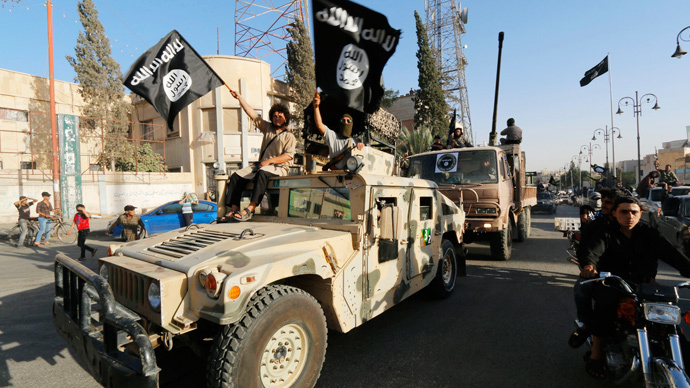 The vehicles “gave this massive boost to the forces of ISIS, who then stepped up their war against Syria. And don’t forget that the war in Syria up until that time… the initiative and the momentum had very much been with the Syrian government,” Glazebrook stressed. What happened in Mosul last year “fits in with the overall trajectory of British and US policy of backing these kind of [sectarian] forces,” he added. The writer stopped short of saying that the whole Humvee affair could have been orchestrated from abroad, stressing that military hardware and ammunition “does get left during conflict… not every incident in this war is necessarily by design.” However, Glazebrook said he believes the conflict is a part of the West’s policy of destabilizing developing countries, and that Libya and Syria are part of this strategy. “The West’s strategy of using these sectarian ‘death squads’ to destabilize and destroy the societies of the Middle East and North Africa to prevent them acting as independent powers, acting in unity… this strategy is actually aimed at the Global South as a whole, it’s part of the war against the rise of the BRICS countries,” Glazebrook said.